What do the Huawei P20 Pro and the Google Pixel 2 XL have in common? They boast the best smartphone cameras currently in circulation. Despite this, we can clearly see many differences in the camera modules, design, software experience and features. It is for precisely this reason that we have decided to do a comparison of them. Huawei P20 Pro review: is three the magic number? Looking at the Huawei P20 Pro, two aspects jump out immediately: it's an attractive smartphone, but it looks too similar to the iPhone X. Yes, Huawei's flagship is not original, but rather reflects Apple's style, from which it tries to differentiate itself with the Twilight version, which creates beautiful lighting effects. However, the P20 Pro remains an elegant and modern smartphone that leaves its mark, especially when viewed from behind: the shiny glass body acts practically as a mirror, and moves the eye-catching cameras and logos to the left side. The result? A minimalist rear panel, despite the trio of photo sensors aligned vertically. It is a shame, however, that fingerprints accumulate too easily on the body. The P20 Pro is handy to use but there are two small details that I personally don't like: the camera protrusion on the back and the earpiece enclosed in the notch. However, the build quality is very good and thanks to IP67 certification you won't have to worry about water and dust. Yes, the P20 Pro certainly has a more modern look thanks to the coloring and the trendy notch. But do we want to talk about the Google Pixel 2 XL? 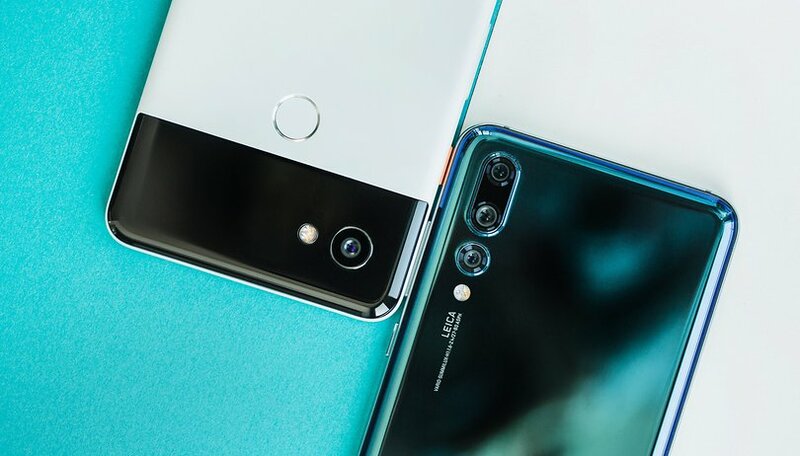 The smartphone made by Google is practically immune to the fingerprints on the back of the smartphone thanks to the aluminum shell, except for the small glass window around the camera. This also makes it more resistant to falls and less prone to unsightly scratches on the body. Do I have to go on about the particular curvature of the front glass and the orange power button or is this enough? The camera on the Pixel 2 XL also protrudes slightly, but it's not as annoying as the P20 Pro's, if you put your smartphone on the table it doesn't wobble glaringly. And then who still uses the smartphone on the table? Certainly not me (nothing to do with the fact that the fingerprint reader on the body is inaccessible by lying the Pixel on the desk, no no). Seriously, the Google Pixel 2 XL fingerprint reader is fast. Not as much as the ones used by Huawei but at least in a better place: for me the fingerprint reader in the front reminds too much of the Samsung smartphones of 2016, on the back is more discreet and comfortable but these are personal tastes. The "panda" color to the touch seems almost ceramic and, although it is not shiny, it makes Pixel 2 XL unique in its own way. On the front of the P20 Pro is a FullView display that frees itself of the side bezels, fingerprint reader under and notch above. The notch: there are those who love it, those who hate it and those who, in moments of indecision, can still hide it through the software option in the menu settings. The display will not be the best in the world and the bezels that surround it are not eliminated but I would never give up these fantastic stereo front speakers (yes, the stereo speakers are also present on P20 Pro) and the ability to call Google Assistant by squeezing the smartphone with, well...the notch. The future potential for a notch arrived via software on Pixel 2 XL with the first Developer Preview of Android P but I'm sure it will not remain in the final version. After all, the Developer Preview is for developers to test new apps and Google wanted to provide as much support as possible. The P20 Pro offers three cameras on the body (40MP with f/1.8, 20MP with f/1.6, 8MP with f/2.4) that surprised us positively especially for the night shots without the support of a tripod and for portraits full of detail. Night mode and 3X zoom are two of the highlights of the P20 Pro's camera, which also introduces SuperSlow Motion in HD at 960fps. Note how well the camera software is done. Beyond the shots, it's really appreciable how any user, even a beginner who doesn't intend to get involved in Pro mode, can get some beautiful photos. It should also be noted that the P20 Pro is, for DxO Mark, the best camera phone on the market: with a total of 109 points, it beats all the other competition. The Google Pixel 2 XL was the best camera phone ever from the moment of its presentation until early March when the next generation smartphones were presented, but it still holds its own. A manual mode is missing in the camera application, but what if your smartphone can process virtually all your photos perfectly on its own? Slow motion at 240fps is more than enough for most situations. The P20 Pro gets some amazing results with its new trio of cameras, but the fact that Pixel 2 XL remains on the podium of the best cameras in the world with only one 12MP sensor f/2.0 and is only bypassed by the Huawei P20 and Galaxy S9+ still means something. Here we are both in agreement! Both the P20 Pro and Pixel 2 XL run Android 8.1 Oreo (unless you downloaded the first Android P Developer Preview to your Google smartphone). Huawei customizes its devices with EMUI 8.1, and in this respect it stands out from the pure experience offered by Pixel. However, I must admit that, in addition to the possibility of activating Assistant by squeezing the smartphone, the Pixel 2 XL, despite being Google's own creation, does not offer exclusive functions. The software updates will reach the Pixel 2 XL first, but it must be admitted that for major releases, Huawei is doing a good job with the updates. Android P: which devices will receive the update? EMUI offers by default some useful services such as App Twin, the ability to block some apps or to hide their data in a private section. The overall experience is fluid but the software could be improved: if you're used to using stories on Instagram, for example, you'll be disappointed by the imperfect implementation of the notch. There's one thing the P20 Pro can do that the Pixel 2 XL can't: turn into a PC thanks to the desktop mode and a USB type C cable. It's a feature already present on the Mate 10 Pro that for some users, not all, can be very comfortable. The NPU, Neural Processing Unit, can be considered another exclusive feature of the Huawei device which, on a practical level, translates into the application of artificial intelligence in the recognition and processing of images and in translation. The infrared sensor is present, but Bluetooth 5.0, FM Radio, headphone jack and possibility to expand the internal memory are missing. It all depends on your needs! The Pixel 2 XL has a very good ear. I am referring to the fact that it is able to recognize the songs played in the surrounding environment without the need for extra apps and all this even offline! A function that almost borders on black magic. It is also able to free up internal memory autonomously by uploading your images and videos to Google Photos in original quality and then delete them from your smartphone. All without consuming the few free GBs you have on your account, those who buy a Pixel are entitled to unlimited space for the content uploaded from their smartphone. The last Google smartphone also has an NPU but in this case it's called Pixel Visual Core. This co-processor is used to improve the processing speed and photo quality of all applications used on your smartphone such as WhatsApp or Instagram. If you capture an image with such applications, all the optimizations of the P20 Pro's photo software are missing, but the Google HDR+ remains. And what about the wonderful portraits made with the front camera? Although the P20 Pro was released in 2018, it integrates a 2017 processor, the Kirin 970 supported by 6GB of RAM and 128GB of internal memory. The Chinese flagship has more memory since its launch, and in benchmark tests the P20 Pro also beats Google's smartphone in this category. In benchmark tests, however, it's the GPU of the Pixel 2XL that gives the best results, as opposed to the CPU that on Geekbench is outperformed by the GPU of the P20 Pro. In daily use, the P20 Pro is fast with multitasking, games and any other task. Even the 4,000 mAh battery does a good job and under intensive use can get to the end of the day with about 15/20% charge still available, with a more moderate use you can keep it alive for a day and a half without problem. For number lovers, the P20 Pro on the PC Mark benchmark test reported a result of 9 hours and 33 minutes. Pixel 2 XL also has a previous generation CPU but this doesn't mean it can't keep up. The Snapdragon 835 and its 4GB of RAM are more than enough to complete any operation without any problem. In addition, clean software and Google optimization literally make this smartphone fly, it is almost impossible to notice frame losses or obvious stops. In games there are never problems although obviously newer smartphones are able to get the same result with less effort. The 3,520 mAh battery is not miraculous, but sufficient. The actual time of use is far superior to other prestigious competitors always exceeding 7 hours of screen time per day but does not keep pace with the excellent work done by Huawei. The two smartphones differ in design, but both offer users excellent performance in all fields. First and foremost, the camera. Whether you choose the P20 Pro from Huawei or the Pixel 2 XL from Google, you'll put in your pocket a flagship that for all intents and purposes will not disappoint you. Are software updates and security patches a priority for you? Google's device is what you need to buy. The Pixel 2 XL, it must be said, is also cheaper: you can find it on Amazon for about $830 (£720 in the UK). The P20 Pro costs £799 in the UK and, due to the US Government's suspicion of Huawei, isn't even officially available stateside. It can, however, be found as an unlocked international version on Amazon for $1,200 and up. If the budget and carrier support is not a problem and you prefer to have a more modern looking smartphone that also offers support for Dual SIM, Huawei has the answer! Choose “Huawei P20 Pro” or “Pixel 2 XL”. "The P20 Pro gets some amazing results with its new trio of cameras, but the fact that Pixel 2 XL remains on the podium of the best cameras in the world with only one 12MP sensor f/2.0 and is only bypassed by the Huawei P20 and Galaxy S9+ still means something." Well, actually, no. All things considered, the P20 or the S9+ do not bypass the Pixel 2. The latter still takes the best pics, overall. Bigger sensors in the Samsung and Huawei do allow for more detail, and by that physical difference alone, I would have expected these two phones to outdo the Pixel 2 but they don't. It's not even a clear cut win against the Pixel with low-light night shots either. Google still reigns due to it's processing superiority. The bottom line is that some will definitely choose the Google pixel 2 while others will prefer the Huawei P20. As for me, I have not use the two phones but if I where to choose base on the design and the camera I will go for the Huawei P20. The three camera arrangement is what I find more appealing on the phone plus the bigger screen size and the panel which speak more of a quality than the Pixel 2. I'm extremely happy with my Pixel 2. It takes truly amazing pictures. I'm intrigued by the P20 but disappointed it's not available in the US.